Anatomy of the respiratory system, showing the trachea and both lungs and their lobes and airways. Lymph nodes and the diaphragm are also shown. Oxygen is inhaled into the lungs and passes through the thin membranes of the alveoli and into the bloodstream (see inset).Non-small cell lung cancer is a disease in which malignant (cancer) cells form in the tissues of the lung. This imaging test takes less than five minutes and can detect lung cancer when it is most treatable – before you have symptoms. Fine-needle aspiration biopsy of the lung. The patient lies on a table that slides through the computed tomography (CT) machine, which takes x-ray pictures of the inside of the body. The x-ray pictures help the doctor see where the abnormal tissue is in the lung. A biopsy needle is inserted through the chest wall and into the area of abnormal lung tissue. A small piece of tissue is removed through the needle and checked under the microscope for signs of cancer.Fine-needle aspiration (FNA) biopsy of the lung: The removal of tissue or fluid from the lung using a thin needle. A CT scan, ultrasound, or other imaging procedure is used to locate the abnormal tissue or fluid in the lung. A small incision may be made in the skin where the biopsy needle is inserted into the abnormal tissue or fluid. A sample is removed with the needle and sent to the laboratory. A pathologist then views the sample under a microscope to look for cancer cells. A chest x-ray is done after the procedure to make sure no air is leaking from the lung into the chest. Bronchoscopy. A bronchoscope is inserted through the mouth, trachea, and major bronchi into the lung, to look for abnormal areas. A bronchoscope is a thin, tube-like instrument with a light and a lens for viewing. It may also have a cutting tool. Tissue samples may be taken to be checked under a microscope for signs of disease.Bronchoscopy: A procedure to look inside the trachea and large airways in the lung for abnormal areas. A bronchoscope is inserted through the nose or mouth into the trachea and lungs. A bronchoscope is a thin, tube-like instrument with a light and a lens for viewing. It may also have a tool to remove tissue samples, which are checked under a microscope for signs of cancer. Thoracoscopy: A surgical procedure to look at the organs inside the chest to check for abnormal areas. An incision (cut) is made between two ribs, and a thoracoscope is inserted into the chest. A thoracoscope is a thin, tube-like instrument with a light and a lens for viewing. It may also have a tool to remove tissue or lymph node samples, which are checked under a microscope for signs of cancer. In some cases, this procedure is used to remove part of the esophagus or lung. If certain tissues, organs, or lymph nodes can’t be reached, a thoracotomy may be done. In this procedure, a larger incision is made between the ribs and the chest is opened.Thoracentesis: The removal of fluid from the space between the lining of the chest and the lung, using a needle. A pathologist views the fluid under a microscope to look for cancer cells. If lung cancer is found, taking part in one of the many clinical trials being done to improve treatment should be considered. Clinical trials are taking place in most parts of the country for patients with all stages of non-small cell lung cancer. Information about ongoing clinical trials is available from the NCI Web site. CT scan (CAT scan): A procedure that makes a series of detailed pictures of areas inside the body, such as the brain and abdomen, taken from different angles. The pictures are made by a computer linked to an x-ray machine. A dye may be injected into a vein or swallowed to help the organs or tissues show up more clearly. This procedure is also called computed tomography, computerized tomography, or computerized axial tomography. PET (positron emission tomography) scan. The patient lies on a table that slides through the PET machine. The head rest and white strap help the patient lie still. A small amount of radioactive glucose (sugar) is injected into the patient's vein, and a scanner makes a picture of where the glucose is being used in the body. Cancer cells show up brighter in the picture because they take up more glucose than normal cells do.PET scan (positron emission tomography scan): A procedure to find malignant tumor cells in the body. A small amount of radioactive glucose (sugar) is injected into a vein. The PET scanner rotates around the body and makes a picture of where glucose is being used in the body. Malignant tumor cells show up brighter in the picture because they are more active and take up more glucose than normal cells do. Endoscopic ultrasound-guided fine-needle aspiration biopsy. An endoscope that has an ultrasound probe and a biopsy needle is inserted through the mouth and into the esophagus. The probe bounces sound waves off body tissues to make echoes that form a sonogram (computer picture) of the lymph nodes near the esophagus. The sonogram helps the doctor see where to place the biopsy needle to remove tissue from the lymph nodes. This tissue is checked under a microscope for signs of cancer.Endoscopic ultrasound (EUS): A procedure in which an endoscope is inserted into the body. An endoscope is a thin, tube-like instrument with a light and a lens for viewing. A probe at the end of the endoscope is used to bounce high-energy sound waves (ultrasound) off internal tissues or organs and make echoes. The echoes form a picture of body tissues called a sonogram. This procedure is also called endosonography. EUS may be used to guide fine needle aspiration (FNA) biopsy of the lung, lymph nodes, or other areas. Mediastinoscopy. A mediastinoscope is inserted into the chest through an incision above the breastbone to look for abnormal areas between the lungs. A mediastinoscope is a thin, tube-like instrument with a light and a lens for viewing. It may also have a cutting tool. Tissue samples may be taken from lymph nodes on the right side of the chest and checked under a microscope for signs of cancer. In an anterior mediastinotomy (Chamberlain procedure), the incision is made beside the breastbone to remove tissue samples from the lymph nodes on the left side of the chest.Mediastinoscopy: A surgical procedure to look at the organs, tissues, and lymph nodes between the lungs for abnormal areas. An incision (cut) is made at the top of the breastbone and a mediastinoscope is inserted into the chest. A mediastinoscope is a thin, tube-like instrument with a light and a lens for viewing. It may also have a tool to remove tissue or lymph node samples, which are checked under a microscope for signs of cancer. Stage IIIA non-small cell lung cancer (1). Cancer has spread to certain lymph nodes on the same side of the chest as the primary tumor. The cancer may have spread to (a) the main bronchus; (b) lung lining, chest wall lining, or chest wall; (c) diaphragm; and/or (d) membrane around the heart; and/or (e) there may be one or more separate tumors in the same lobe of the lung. Cancer may have spread to the nerve that controls the diaphragm, and part or all of the lung may have collapsed or become inflamed (not shown).Stage IIIA is divided into three sections depending on the size of the tumor, where the tumor is found, and which lymph nodes have cancer (if any). Stage IIIB non-small cell lung cancer (1). Cancer has spread to lymph nodes above the collarbone or on the opposite side of the chest as the primary tumor. The cancer may have spread to (a) the main bronchus; (b) lung lining, chest wall lining, or chest wall; (c) diaphragm; (d) heart or the membrane around it; (e) major blood vessels that lead to or from the heart; (f) trachea; (g) esophagus; (h) sternum; and/or (i) carina; and/or (j) there may be one or more separate tumors in any of the lobes of the lung. Part or all of the lung may have collapsed or become inflamed and cancer may have spread to the backbone and/or the nerves that control the diaphragm and larynx (not shown).Stage IIIB is divided into two sections depending on the size of the tumor, where the tumor is found, and which lymph nodes have cancer. 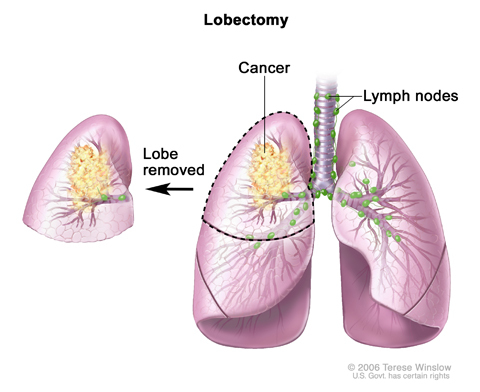 Lobectomy. 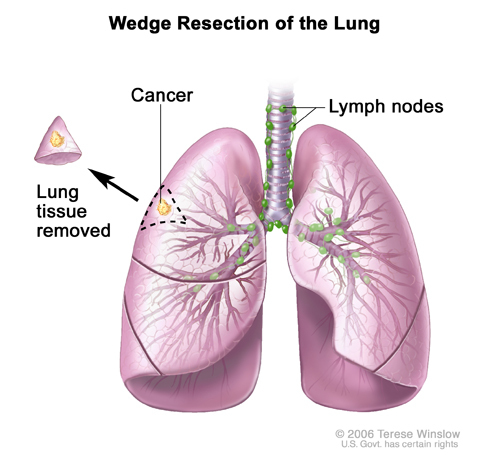 A lobe of the lung is removed.Wedge resection: Surgery to remove a tumor and some of the normal tissue around it. When a slightly larger amount of tissue is taken, it is called a segmental resection. Pneumonectomy. The whole lung is removed.Pneumonectomy: Surgery to remove one whole lung. Radiosurgery is a method of delivering radiation directly to the tumor with little damage to healthy tissue. It does not involve surgery and may be used to treat certain tumors in patients who cannot have surgery. The way the radiation therapy is given depends on the type and stage of the cancer being treated. It also depends on where the cancer is found. For tumors in the airways, radiation is given directly to the tumor through an endoscope. Targeted therapy is a type of treatment that uses drugs or other substances to attack specific cancer cells. Targeted therapies usually cause less harm to normal cells than chemotherapy or radiation therapy do. Monoclonal antibodies and small-molecule tyrosine kinase inhibitors are the two main types of targeted therapy being used in the treatment of non-small cell lung cancer. Monoclonal antibodies used to treat non-small cell lung cancer include bevacizumab and cetuximab. Bevacizumab binds to vascular endothelial growth factor (VEGF) in the blood and tissues and may prevent the growth of new blood vessels that tumors need to grow. Cetuximab is a monoclonal antibody that acts as a tyrosine kinase inhibitor. It binds to epidermal growth factor receptor (EGFR), which is a tyrosine kinase protein, on the surface of cancer cells and works to stop the cells from growing and dividing. Small-molecule tyrosine kinase inhibitors are targeted therapy drugs that work inside cancer cells and block signals needed for tumors to grow. Small-molecule tyrosine kinase inhibitors may be used with other anticancer drugs as adjuvant therapy. Small-molecule tyrosine kinase inhibitors used to treat non-small cell lung cancer include erlotinib and gefitinib. They are types of epidermal growth factor receptor (EGFR) tyrosine kinase inhibitors. Crizotinib is another type of small-molecule tyrosine kinase inhibitor that is used to treat non-small cell lung cancer. It is used to treat non-small cell lung cancer that has certain mutations (changes) in the anaplastic lymphoma kinase (ALK) gene. The protein made by the ALK gene has tyrosine kinase activity. Chemoprevention is the use of drugs, vitamins, or other substances to reduce the risk of cancer or to reduce the risk cancer will recur (come back). Check the list of NCI-supported cancer clinical trials that are now accepting patients with occult non-small cell lung cancer. For more specific results, refine the search by using other search features, such as the location of the trial, the type of treatment, or the name of the drug. Talk with your doctor about clinical trials that may be right for you. General information about clinical trials is available from the NCI website. Check the list of NCI-supported cancer clinical trials that are now accepting patients with stage 0 non-small cell lung cancer. For more specific results, refine the search by using other search features, such as the location of the trial, the type of treatment, or the name of the drug. Talk with your doctor about clinical trials that may be right for you. General information about clinical trials is available from the NCI website. Check the list of NCI-supported cancer clinical trials that are now accepting patients with stage I non-small cell lung cancer. For more specific results, refine the search by using other search features, such as the location of the trial, the type of treatment, or the name of the drug. Talk with your doctor about clinical trials that may be right for you. General information about clinical trials is available from the NCI website. Check the list of NCI-supported cancer clinical trials that are now accepting patients with stage II non-small cell lung cancer. For more specific results, refine the search by using other search features, such as the location of the trial, the type of treatment, or the name of the drug. Talk with your doctor about clinical trials that may be right for you. General information about clinical trials is available from the NCI website. External radiation therapy alone (for patients who cannot be treated with combined therapy, as palliative treatment to relieve symptoms and improve the quality of life). Chemotherapy and radiation therapy given as separate treatments over the same period of time, followed by surgery. Check the list of NCI-supported cancer clinical trials that are now accepting patients with stage III non-small cell lung cancer. For more specific results, refine the search by using other search features, such as the location of the trial, the type of treatment, or the name of the drug. Talk with your doctor about clinical trials that may be right for you. General information about clinical trials is available from the NCI website. External or internal radiation therapy as palliative therapy, to relieve pain and other symptoms and improve the quality of life. Clinical trials of new radiation therapy schedules and new combinations of treatments. Maintenance therapy with an anticancer drug to help keep cancer from progressing, after combination chemotherapy. Combination chemotherapy and targeted therapy with a monoclonal antibody, such as bevacizumab or cetuximab. Targeted therapy with a small-molecule tyrosine kinase inhibitor, such as erlotinib or crizotinib. Check the list of NCI-supported cancer clinical trials that are now accepting patients with stage IV non-small cell lung cancer. For more specific results, refine the search by using other search features, such as the location of the trial, the type of treatment, or the name of the drug. Talk with your doctor about clinical trials that may be right for you. General information about clinical trials is available from the NCI website. Laser therapy or internal radiation therapy using an endoscope. Radiosurgery (for certain patients who cannot have surgery). Surgery to remove a very small amount of cancer that has spread to the brain. Check the list of NCI-supported cancer clinical trials that are now accepting patients with recurrent non-small cell lung cancer. For more specific results, refine the search by using other search features, such as the location of the trial, the type of treatment, or the name of the drug. Talk with your doctor about clinical trials that may be right for you. General information about clinical trials is available from the NCI website.